House of Fraser has held cash talks with a fund that specialises in distressed retailers. The department store’s worried lenders have called in EY to assess the business. Next warned last week that the High Street is facing the toughest trading conditions in 25 years. LONDON – British department store House of Fraser is facing a battle for survival amid a funding crunch. Sky News reported late on Friday that House of Fraser’s lenders have appointed accountants EY to advise the company on strategy. The Sunday Times then reported that the department store asked for an emergency £40 million loan from Alteri Investors, a fund that specialises in struggling retailers. The Telegraph reports that these talks collapsed because House of Fraser had already staked all of its core assets as collateral in other deals. House of Fraser has a £400 million debt pile and, along with other retailers, is struggling to get to grips with a High Street slowdown. Inflation has hit consumer spending and many of the pounds that are being spent are going to online retailers. Next warned last week that it is seeing the toughest trading conditions in 25 years, while the likes of Maplin and Toys R Us have gone bust in recent weeks. 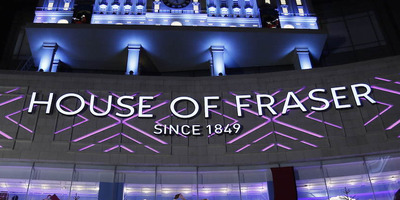 House of Fraser was acquired by Chinese group Sanpower for £450 million in 2014, but the chain has struggled since then. House of Fraser lost £9 million last year and sales over the crucial Christmas period fell by 2.9%. Sanpower agreed to sell 51% of its stake in the department store earlier this month. The department store received a £25 million funding injection from Sanpower last September to drive a turnaround of the business, looking to cut costs of up to £26 million a year. In January, House of Fraser also agreed to sell its brand and associated intellectual property to a Chinese company for £30 million. A source close to the company downplayed discussions with Alteri, saying the two parties met only to hold early stage exploratory discussions. House of Fraser’s CEO Nigel Oddy left in late 2016 after two years in the job. Other executives to leave include chief customer officer, who left last September after less than a year in the role, and the department store’s COO, who had been with the business since 2008, and CIO both left in February. Department stores, which stock everything from perfume to trousers, have struggled to differentiate themselves in the age of Amazon. Most do not produce their own goods, merely stock products from other brands. Often they can be found cheaper online as digital stores do not have the same overheads. House of Fraser asked landlords to reduce its rents to help it keep operating in January.